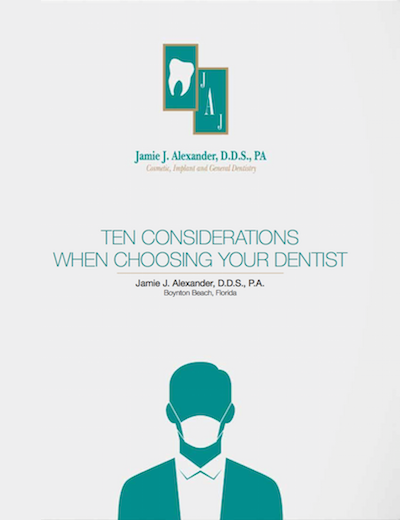 Dr. Jamie Alexander of Boynton Beach, FL takes pride in customizing the highest quality dentures. Today, there are treatment options that include implant supported dentures for better-than-ever function and long-lasting results. When all of the teeth are missing on the upper or lower jaw, an overdenture is used. Traditionally, a full denture is held in the mouth by resting over the gums and forming a seal with the gums. The denture is made of an acrylic plastic base that is colored to look like gum tissue, and it supports a full set of prosthetic teeth. Wearers remove their denture for cleaning and while asleep at night. It is very common for an overdenture to slip out of place while eating and speaking. Today, we have an alternative. Instead of wearing a removable overdenture, you can wear a highly stable, bar-retained hybrid denture fixed on dental implants. This type of denture does not cover the soft palate of the mouth so eating is more enjoyable. Biting strength is restored so you can eat all of your favorite foods. The denture never slips because it is firmly attached to your jawbone. And because the dental implants stimulate bone growth, the jawbone does not undergo bone resorption and your facial structure is maintained. Hybrid dentures are called “All-on-4” because edentulous patients (patients without teeth) can have an upper or lower overdenture fixed on as few as four dental implants. In fact, Nobel Biocare and Straumann dental implants achieve such a high initial stability that a precision-fit hybrid denture can be delivered in the same appointment as implant placement. Hybrid dentures preserve your jawbone quality and bone density. In contrast, if you wear a removable denture, your bone will atrophy and your facial structure will change, taking on a more aged appearance. A traditional overdenture will become ill-fitting due to bone recession and changes in the overlying gum tissue as it conforms to the new shape of the bone. Gum tissue irritation is eliminated because your denture never slips. Hybrid dentures are so stable they feel and function more like natural teeth. The strength of your bite will be so increased that you can eat all of your favorite foods. You will no longer need to use messy adhesives to secure your denture in place. Since your new hybrid denture does not cover the roof of your mouth, you will be better able to enjoy your food! Your health will improve as you eat the full range of nutritious foods and you drink more water without concern for loosening your denture. You will be able to clean your hybrid denture like natural teeth. Hybrid dentures fixed on dental implants last much longer than removable dentures that typically need to be relined or replaced within ten years. Hybrid dentures cannot be removed by the wearer and are worn 24 hours a day. Only the dentist can remove them. You will brush and floss, much like you would natural teeth. When you visit us for your regular twice-a-year appointments, Dr. Alexander will remove the denture for cleaning and examine your gum and bone tissue. If you have difficulty cleaning your denture, we will provide in-office cleaning on a more frequent basis until you become proficient at it. And here’s some good news! A hybrid denture fixed on dental implants will last much longer (with proper care) than a removable denture. Are Hybrid Implant Supported Dentures Right for You? If you have lost all of your teeth on an arch or are about to lose them, a hybrid denture is truly the highest standard of care and will provide you with the highest quality of life. 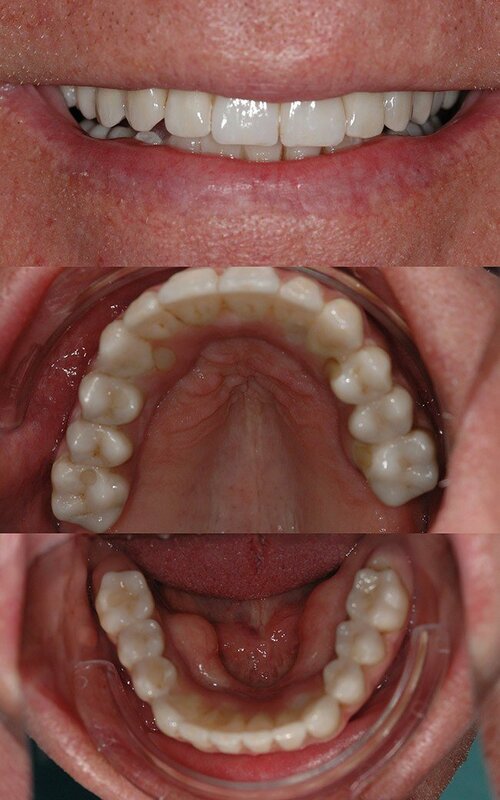 Patients in need of both an upper and lower full denture can have both arches restored with hybrid dentures. 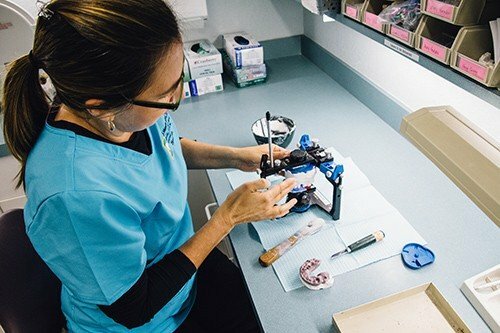 Dr. Jamie Alexander offers a complimentary initial consultation for dental implant therapy and will be happy to evaluate your oral health circumstances and the appropriateness of the All-on-4 implant procedure for you. If you choose this treatment, Dr. Alexander will work closely with his expert local dental laboratory technicians. Together, they’ll make your custom hybrid denture prior to the oral surgery appointment. He will work closely with his preferred expert implant surgeon to place your dental implants, implant attachments, and hybrid denture. Both he and your surgeon will provide follow-up care. Dr. Alexander always uses a top dental lab and insists on the latest, highest quality dental materials. Your hybrid denture will have the appearance of a natural dentition that is esthetically beautiful. Not only will you have an attractive smile, you will be able to eat and speak easily. Many patients tell us their fixed denture has given them great social confidence—and they are once again fully enjoying life. Many tell us it is the best investment they have ever made. The personalized, routine maintenance care you receive in our office will ensure your hybrid denture lasts and lasts. With today’s digital 3-D technology all of this is done comfortably, predictably and precisely. Call for your complimentary All-on-4 Hybrid Denture consultation today!